If I had a cold, my grand mom would give me an egg flip… not to forget half boiled eggs, hard boiled ones & eggs on toast, scrambled eggs & omelettes & above all the egg curries! The list is never ending when I think about the lovely puddings & custards, cakes & innumerable desserts we enjoyed & are still enjoying. Eggs are an integral part of every day living & dining. Like always, eggs rule & have saved my day many times… It is versatile & you can rustle up a dish with ease & within minutes. 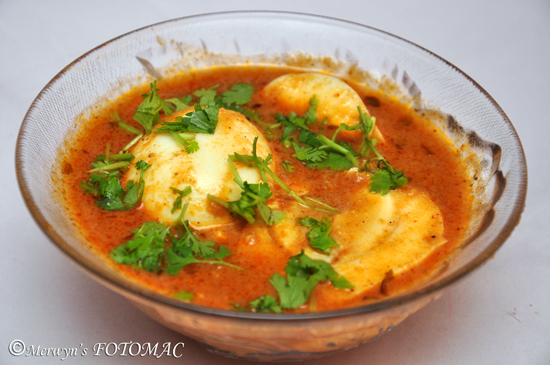 It accompanies rotis or rice & can be enjoyed just the way it is! First boil the eggs in sufficient water to which a few drops of vinegar & some salt is added for about 12 mins. Let it stand in the hot water till the water turns warm. Then cool them in some normal water. De-shell the eggs & make 4 vertical slits on each egg making sure you do not slice through the yolks & cut in pieces. Keep the slit eggs aside for further use. You may halve the eggs if you like it that way. Heat oil in a sufficiently deep pan till hot. Add the onions & saute them till soft & translucent. Transfer the fried onions from the pan to a food processor or masala grinder/blender with a slotted spoon. Grind the onions with soaked Kashmiri chillies, tomatoes to a thick & smooth paste. Transfer it to a bowl. Use the water which was used to soak the chillies & a little more water if needed to rinse the masala grinder & reserve this water in a bowl for further use. Heat the same pan in which you fried the onions till hot & add the reserved masala paste. Saute till rawness disappears or for about 2 to 3 mins. Add the ginger-garlic pastes, & all the above mentioned dry spices & saute on low heat till the oil begins to separate from the masala. Then add the reserved masala water & another 2 cups of water to the pan & bring to a boil on medium heat. Gently lower the boiled & slit eggs into the gravy. Let it simmer for 10 mins. or cook till desired thickness of gravy. Add a pinch of sugar & adjust salt to taste. Take the pan off the heat & garnish with chopped coriander leaves. Serve hot with rice or rotis & enjoy with wedges of lime.